The popularity of ceramic tile has continued to grow, and with good reason. Tile comes in many beautiful patterns and colors, and is a cost-effective floor covering. It handles high traffic well and is relatively easy to care for. However, just like carpet, tiled floors require professional attention to keep them looking their best and to optimize their lifespan. Grout lines darken over time as dirt and oil become trapped in the pores of the grout. Mopping won’t clean your grout! 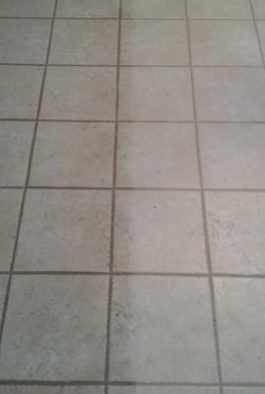 Only a powerful scrub and steam cleaning can effectively power wash your grout lines and make them light again. Trust our certified technicians to restore your tiled floors’ natural beauty. Using industry-approved practices and ultra-powerful truck mounted or portable cleaning system, we blast away even stubborn dirt and grime. Vacuuming – If dry soil is present, the tiled floors will first be vaccuumed. Application of Cleaning Solution – An alkaline based tile and grout cleaner is sprayed onto the tile, which begins to break down dirt, oil and odors. Agitation – Based on the level of soil, a weighted floor machine can be used to scrub the tile and grout before the steam cleaning. Washing and Rinsing – After allowing adequate dwell time, the tile and grout are thoroughly rinsed with pressurized hot water, simultaneously vacuuming away the waste water, leaving your tile beautiful and streak free. Drying – Tile dries in a mere 15-20 minutes, while it will take 3-4 hours for the grout lines to fully dry and lighten to their final result. Grout Sealant– This optional protectant can be applied to the grout lines to add a breathable, protective barrier, reducing future staining and prolonging its life.